Join us for 30 days and get ready for Fall! Fall Challenge runs October 1-30, 2018. Take advantage of the Early Bird Pricing - join for only $27! and you’re tired of trying crazy diets that don’t work, you’ll want to keep reading. It can be confusing, frustrating and a bit overwhelming to know what to do for long-term success. There’s so much conflicting information everywhere we turn, and sometimes we just feel defeated and give up. ​and rapid weight loss often leads to rapid weight GAIN. It’s not your fault that you’ve been fooled into thinking that restrictive dieting is the only way to reach your goals. so you can make sustainable changes you can live with FOREVER and be happy about. There are no crazy tricks, pills, potions or gimmicks! You’ll ALSO get the most delicious, easy-to-prepare recipes PLUS a community of support that’s with you every step of the way. Simple, effective tips to save you TIME, CALORIES and MONEY, without feeling deprived. Hint: you don’t have to spend hours at the gym to get in great shape. is critical for weight loss (not just the number of calories). what ONE thing you may be doing unknowingly to sabotage your efforts, and how to easily fix it. Since the Jump Start program is online, you can participate no matter where you live! (please invite your friends – extra support is awesome!). • One simple, transformational strategy each week to get you on the right track. • Templates and worksheets to make tracking and planning easy. • INSTANT access to the Exclusive Membership Private Facebook Group for support during the 30 days. • SUPPORT, MOTIVATION and INSPIRATION for 30 days. • Delicious, Nutritious Recipe eGuide for breakfast, lunch, dinner and side dishes. 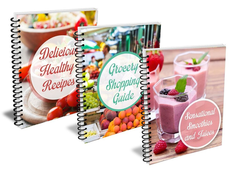 • A Grocery Shopping Guide to help you easily navigate healthy food choices at the store. • ‘Sensational Smoothies and Juices’ recipe guide. Grab a friend or two and come join us! 30 Days from now, you’ll be glad you did! Fun – Motivation – Inspiration – Support – PRIZES! This Fall Challenge runs October 1-30, 2018. My name is Sara Wolfsen and I’m a Certified Health & Lifestyle Coach. I specialize in helping people make their own healthy changes by providing private health coaching, nutrition education and wellness classes, and gentle weight-loss guidance and support. ​I put this challenge together to make it EASY for people to get back on track with their health and fitness goals. I know how difficult it can be to try to make health and lifestyle changes on your own. Now you’ll be plugged into a community of people that share your same goals. I’ll be there to help you every step of the way. I’d love it if you could join us! Disclaimer: This program is not intended to diagnose, treat, prevent or cure any illness or disease. The information provided in this program is for general educational purposes, has not been reviewed nor approved by the FDA and is not intended to take the place of advice from your medical professional, licensed dietician or nutritionist. You are solely responsible for your health care and activity choices. Participation in this challenge does not constitute a client-coach relationship.